For the travel enthusiast who wants it a bit different. Do you want to experience the real Indonesia at your own pace? Do you want to feel like a guest? Do you want the luxury of complete care, enjoy a tropical garden with a generous pool, a breakfast on the porch and especially no hassle? Then Guesthouse Tanen is the ideal location for you and your company (Villa Tanen is suitable till 12 people). 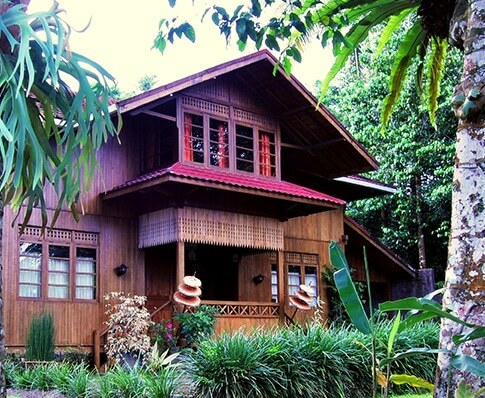 Villa Tanen is an original wooden Javanese villa, made of coconut wood. The interior is Javanese. The plumbing has been adapted to European requirements. The villa is named after the town of Tanen. Tanen lies on the main road to Kaliurang and has no entertainment facilities. Tanen is located in Indonesia in central Java, 21 kilometres north of the cultural capital Yogyakarta. It is a good half hour drive from the airport and train station in Yogyakarta (Java, Indonesia). Tanen is very central to many cultural monuments such as the Borobudur, Prambanan, Imogiri and of course to visit Yogyakarta to visit the world famous Malioboro, the Kraton, Ford Vredeburg, the Water Palace and the many batik and silver shops. Villa Tanen has 6 spacious 2-person rooms, a large living room and a spacious covered veranda. Our staff speaks English and there are a car and driver available for various day trips. You can have lunch or dinner at home for a small fee. The temperature is moderate because the house is at 850 meters altitude. Our villa is on private grounds (3000 m2) Of course the pool is not missing. In the garden there is a large variety of fruit trees, there are opportunities to sit relaxed and there are various game options (basket, table tennis, badminton, two bikes and golf sets). Villa Tanen is suitable till 12 people. You can book per floor, but also the whole house. Your stay includes pick-up service (from Yogyakarta), breakfast, cleaning, bath and bed linen, water, coffee and tea. There is also free WiFi, and 24-hour English speaking staff.